Data visualization - communicating information clearly and effectively through graphical means - is the focus of a presentation by UO physics professor Greg Bothun at 4 p.m. today (Feb. 15) in room 101 of the Knight Library. The free presentation is sponsored by the office for Research, Innovation and Graduate Education. Refreshments will be served. Bothun says federal funding agencies are increasingly interested in the presentation of data and that finding new and better ways of communicating the key aspects of data is a something that can be beneficial to all researchers. Data visualization experts say effective visualizations strike a balance between form and function and - most important - manage to communicate clearly. 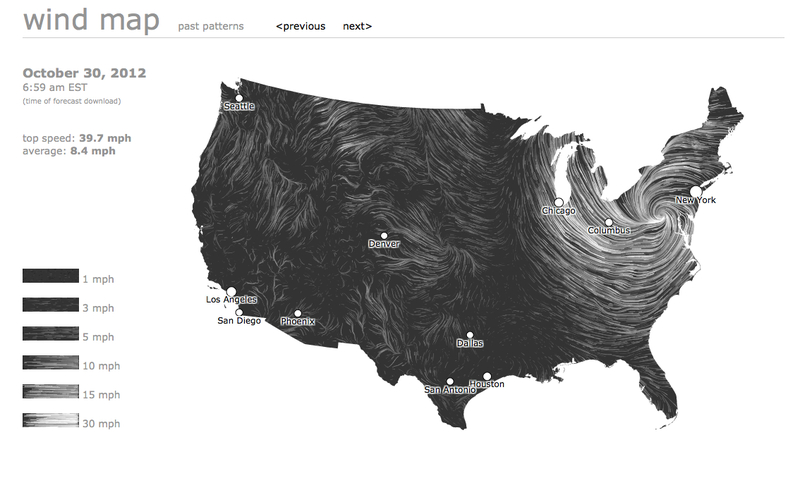 One often-cited example is a wind map of the United States on the day after Hurricane Sandy’s arrival. It was created by a pair of Google computer scientists, using wind data from the National Digital Forecast Database.